View a gallery of photos from Match Day 2019. On Friday, March 15, Kyle Fahey, a fourth-year medical student, stood with his classmates on the third floor of Gino’s East in Chicago, clutching a life-changing white envelope. At the count of five, the students tore open their envelopes in unison. The room filled with cheers as the Class of 2019 learned where they will spend the next phase of their medical careers. 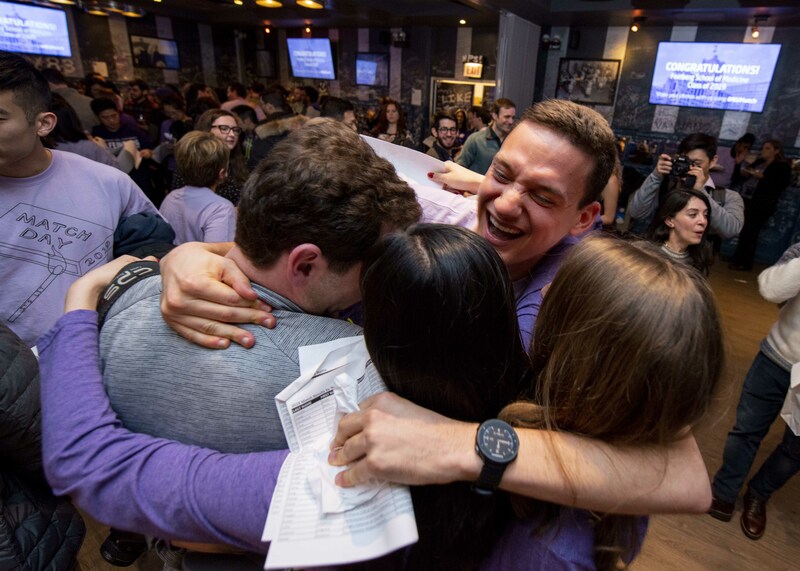 Kyle Fahey and fellow fourth-year medical students celebrate at Match Day after learning where they will spend the next several years of residency training. On Match Day, an annual tradition held on the third Friday of March, all fourth-year students across the country learn — at exactly the same time — where they will train as residents for the next three to seven years. 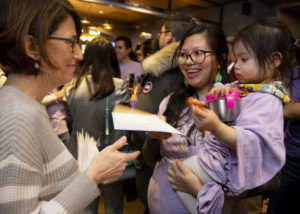 At Northwestern’s Match Day, the class of 2019 high-fived and hugged each other, posed for pictures with their match letters, and raced to call family members and friends with the good news. Residency matches are made by the National Resident Matching Program (NRMP), which uses a computerized algorithm to pair graduating medical students with available training positions at U.S. teaching hospitals. The model takes into account the top choices of both the students and the residency programs. This year’s match, the largest on record, included more than 44,600 registered applicants and more than 35,000 residency positions offered. For Paula Lewis-de los Angeles, a student in the Medical Scientist Training Program (MSTP), Match Day was the result of seven years of MD/PhD studies. She is now headed to Brown University for a triple board program in pediatrics, psychiatry, and child and adolescent psychiatry. Paula Lewis-de los Angeles, a student in the Medical Scientist Training Program, receives her Match Day letter with her daughter. Liz Nguyen and Alex Rodriguez entered the match as a couple. The two students, who met during their first year of medical school, are now headed to Stanford University Medical Center together. The NRMP allows students who choose to match as a couple to link their rank lists together, in order for the two to obtain residencies in the same geographic location. 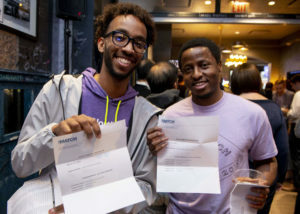 Martin Mutonga (right) celebrates with Mohamed Elsheikh (left) after learning he matched at Yale New Haven Hospital for interventional radiology. For many, Match Day was a moment to not only celebrate their success as medical students, but to look forward to their first few years as physicians. View a full list of 2019 match results.